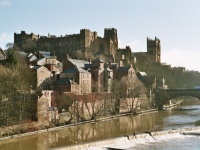 Celebrated, together with Durham Castle, as one of Britain's first UNESCO World Heritage Sites, Durham Cathedral is one of the finest examples of Norman architecture in England. Building began on the church in 1093, and it was largely completed after about 40 years. An icon of northeast England, the cathedral was voted as the nation's best-loved building in a nationwide BBC poll held in 2001. Renowned for its immense architecture, ancient history and deep religious roots, the cathedral is a must-see attraction for any visitor to Durham. Guided tours are conducted daily, and offer an informative and enriching way to explore the magnificent structure.